Question: I know NOTHING about machine tools. Can I still build a live steamer? Answer: It depends on how badly you want to build it. That was the answer that Mr. Charles A. "Carl" Purinton (1898-1999; founder of the "Brotherhood of Live Steamers") used to give people when he was asked if someone with NO experience could still build a live steam locomotive. And it's my answer too. 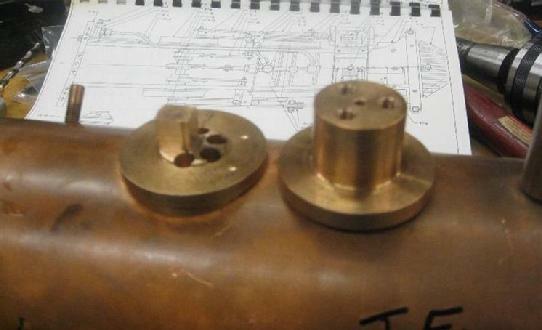 Whether or not YOU can build a "live steamer", depends on how badly you want to build it. Building a live steam locomotive requires machining rough castings and metal stock (round, hex, and flat stock; pipe; tubing, etc.) to blueprint specifications. Typically, building a small simple locomotive requires about 1 to 5 years, depending on how quickly you learn and master new skills, and on how many hours per week you spend on it. Once you have the skills for (and the experience on) a simple engine, you can build a complex engine. Complex engines generally require from 3 to 10 years, but once you have the skills, it's only a matter of how many "hours per week" you spend on it. If you are contemplating building your first locomotive, I would suggest something simple and small. The 3/4" scale Pennsylvania A3 Switcher by Mr. Kozo Hiraoka is a good choice. It is designed for the beginner, and the construction book by Village Press details the entire construction of the locomotive, step by step. The only castings in the original design are the drive wheels, which may be purchased from Friends Models HERE. However cylinder castings are available too. They may be used in lieu of the "fabricated" cylinders in the original design and will provide additional experience in machining from castings. This experience will serve you well for this engine, and others you may build in the future. In fact machining and assembling this engine will provide you with the "hands on learning experience" that you need. You can "make all your mistakes" on this engine; you will learn as you go; and you will see your skills improve by the week. Mr. Hiraoka guides you "step by step" in the instruction book. The feeling of building the engine and seeing your skills improve as you progress, until finally, you have a coal-burning steam engine that you built, is something that simply must be experienced to be fully understood! To see a completed one "under steam", please click the below "YouTube" videos. The first video is the completed locomotive during a "bench test", and the second one shows it in operation on the track. To see one of these locomotives under construction by a "novice" builder (perhaps not unlike you! ), please see HERE. The wheel castings you will see on this builder's website were purchased from Friends Yankee Shop Models, and you can see what they "look like" after machining. When finished the engine's about the size of a large toaster, but it will pull you and a friend up and down your driveway, or around your backyard! And it will be the education and experience you need to get started on that "dream engine" of larger size and more complexity. Another good choice for a small, simple, first-time locomotive is the 3/4" scale Tom Thumb. Very loosely based on an early Baltimore and Ohio prototype, the Tom Thumb was a popular design by Yankee Shop in the 1940s and Friends Models in the 1950s. It used a vertical coal-fired boiler to power a marine-type two cylinder engine geared to the drive wheels. An updated version of Tom Thumb has been developed and is currently a construction feature in LIVE STEAM & OUTDOOR RAILROADING magazine. It's based on the original "Yankee Shop" Tom Thumb of the 1940s, but with modern updates and some design improvements. Joe Friend and an unidentified passenger on the "Yankee Shop" Tom Thumb behind the Friend Box company at Danvers, MA in the 1950s. It is an excellent live steamer on which to learn machining and building skills. Coal fired. Click the photo for more information on "Tom Thumb" or to buy wheel castings for it. For more information on Tom Thumb or to buy wheel castings for it, please click the above photo or click HERE. You will need machines, AND you will need to know how to use them. The below are some basic machines, given as suggestions to help you begin your hobby of building a small-scale live steam engine. Only new machines, available new from their manufacturers or from dealers, are listed here. Used machines are available at machinery dealers, auctions, and on www.ebay.com. Once you learn the use of these machines, and build your first live steam locomotive, you will have the skills and ability to build a live steam engine of more complexity. 9" benchtop belt drive lathe, imported from Taiwan/China. Grizzly, JET, and Enco all offer similar machines. This machine is suitable for locomotives of 2-1/2" gauge, and small locomotives in 3-1/2" gauge. The 9" lathe shown at left will handle all turned parts for the following locomotives: any locomotive in 2-1/2" gauge; plus the 3-1/2" gauge Pennsy A3 Switcher or the New Shay. (It can handle the 3/4" scale USRA Switcher, but a 10" swing machine (see below) for the switcher is recommended). 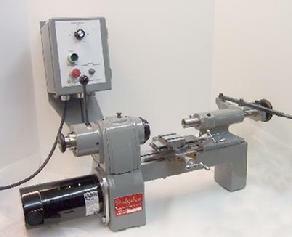 A small mill-drill machine. A benchtop model weighing about 400 pounds, this type machine provides all the power, rigidity, and accuracy you will need to build a locomotive in 2-1/2" gauge, or a small locomotive in 3-1/2" gauge. The next step up in milling machines might be this small, stand-mounted miniature knee mill. 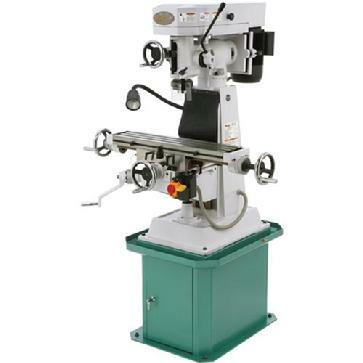 The "knee" allows the entire table to be "cranked" up and down and increases the machine's versatility many-fold compared to the mill-drill machine shown above. ALERT: The owner of Friends Models uses this machine for building live steam locomotives. At right, the "flange and throttle" on a small 3/4" scale locomotive are being machined (by me) on a miniature "knee mill" like the one shown above. This machine is affordable to many; is small enough to fit in most home workshops; and is versatile enough to machine most parts on most small locomotives. This is my miniature knee mill (like the one shown above) being used to machine the flange & throttle on a 3/4" scale locomotive. The part is being held in a "Phase II" 5C indexing attachment. Here is the "flange and throttle", as well as the cover (with holes for the 2 safety valves and the whistle), after much of the machine work has been done. Only the circle of "bolt holes" remains to be done. This is easily handled on the small knee mill and the "5C" indexing attachment. The F.W. Derbyshire Co. formerly of Waltham Massachusetts is well known for its old-fashioned 8mm "WW style" (Webster-Whitcomb) watchmakers' lathes. But did you know that it also manufactures a superb line of toolmakers' lathes, made in Shrewsbury, Mass. USA, that accept 8mm collets, 10mm collets, and 3-C collets? The F.W. Derbyshire toolmakers' lathes offer power, rigidity, accuracy, and old-fashioned American quality. And they're still made "in the USA" in 2015! The Derbyshire toolmakers' lathes are PERFECT for making small accurate parts. Injector cones, piston rods, valve rods, pump parts, piston valves, shuttle valves, small bolts and hardware, etc. 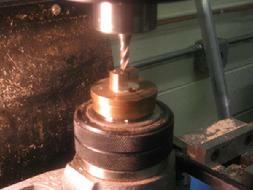 are often difficult and awkward to machine on the larger machines. If you want to machine your small precision parts on a BEAUTIFUL American-made machine, please visit the Derbyshire factory at www.fwderbyshire.com. The F.W. Derbyshire "Type A" toolmakers' lathe. Made in the USA. Approximately 6" swing by 8" between centers, it can accept 8mm, 10mm, or 3-C collets. Once you machine valve rods or injector cones on this machine, you will wonder why you EVER did without such a beautiful machine. The following machine, a 10" swing bench model, is recommended for building the 3/4" scale USRA Switcher. 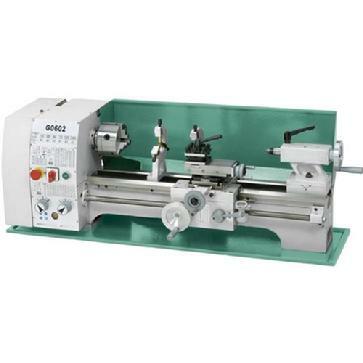 An imported (China/Taiwan) 10" swing bench lathe. This size or larger is recommended for handling the parts on the 3-1/2" gauge USRA Switch Locomotive. Available at www.grizzly.com. South Bend Lathe, in business in South Bend Indiana USA from 1906 until the early 2000s, was a maker of popular "workshop" lathes for decades. Many a live steam locomotive has been built on South Bend 9" Workshop Models, and the once-popular "10-K" (which was a 10" swing lathe built on the bed and framework of a 9" workshop lathe). My first lathe was (and is) an old 10-K, built in 1967 and purchased "used" by father and me in 1990. South Bend has been acquired by a new company and has reopened, and has begun producing some new versions of old South Bend Classics. One model, which is particularly suited to the building of small scale live steamers, is the new version of an old "Workshop" lathe. It's the new South Bend 8" x 18" benchtop lathe. See photo below. It has an 8" swing and 18" between centers. This means it can work on parts up to 8" diameter and 18" long. This will handle all parts on 2-1/2" gauge locomotives, as well as all parts on small 3-1/2" gauge locomotives. Another machine suitable for building small live steamers, is the new and updated South Bend 10-K. It has a 10" swing by 28" between centers. This will handle all parts on all 3-1/2" gauge (and smaller) locomotives. Please visit www.southbendlathe.com for a look at some of the very nice designs they have begun producing again. 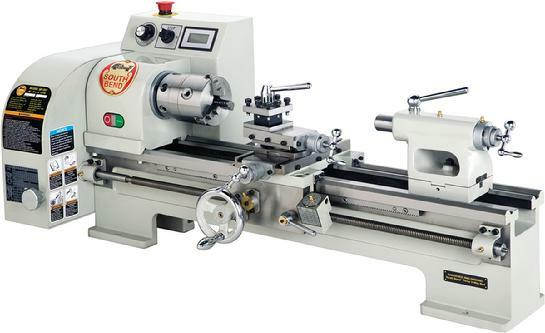 Their new 8" x 18" workshop lathe, as well as the new 10-K, are seen below. They are nice looking machines that will build all the small-scale locomotives you care to build, and that will provide you with a LIFETIME of home workshop enjoyment. They are also small enough to fit into your home or garage! 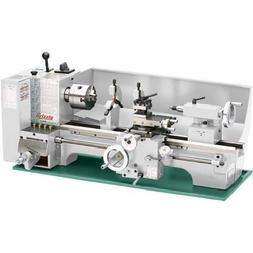 The new South Bend 8" x 18" benchtop lathe is ideal for the newcomer. 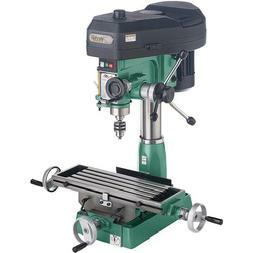 It weighs less than 300 pounds and will fit on a small bench, as well as fit into, any small home workshop. It most closely resembles the South Bends of Yesteryear that the pioneer live steamers used to build locomotives in 2-1/2" and 3-1/2" gauge. More machinery/tooling information coming soon. Please check back often.